Saturday 12th January 2019 at Auchenharvie Ice Rink. This is the second home game for the Stars in the last couple of weeks and the home side started well with a2 goals within the first 3 minutes of the period. Solway looked on the back foot for the majority of the first period and it closed in with the Stars leading 3-0. The second period proved much closer game between the two sides with Solway net minder proving to be difficult to get goals in against. 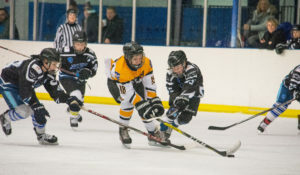 In the third, the Stars picked up the pace again with an onslaught of goals against a seemingly frustrated Solway side. The game itself was fast-paced and proved to be a solid performance from the home team. The final score, in the end, was a comfortable 7-1 to the Stars with their next gaming being away to Elgin next week. Goals from: Dylan Murray x 6, Jacob Woods x 1 (1st goal playing for the Stars), Man of the Match: Dylan Murray. This was the Predators 1st game this year and they were keen to make it a home win. With the rink a buzz from the Stars win and a few of the boys back on ice again it was to be a great game and the Predators came out hard and fast and took full advantage of Solway playing short handed with a player in the penalty box and scored 2 quick power-play goals, swiftly followed by 2 more before the end of the period finished with the Predators in the lead 4-0. 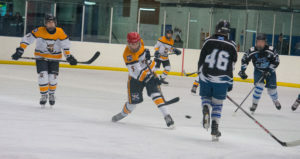 The 2nd period started just as it had left off with the Predators scoring another 3 goals within 4 minutes making it 7 -0. with the 3rd period starting as before with Predators bagging another goal it looked like Solway had given up, but no…they staged a come back which saw them win that period and bag 3 goals. It was a great game to watch and Predators were the more disciplined and hungry team who pulled together and drew from their training sessions to produce a comfortable win. Final Score: Predators WIN 8 – 3 Sharks, Goals from: Antony Curlett x 3, Dylan Murray x 2, Jack Neil, Haydn Woods & Josh Carslaw Man of the Match: Josh Carslaw.